What Is Apple Inc. Spending All of Those R&D Dollars On? A look at a handful of the areas in which the iDevice maker is investing its rapidly growing research and development budget. Apple (NASDAQ:AAPL) has been ramping up its research and development spending and there's little sign that the company is going to take its foot off the proverbial pedal anytime soon. In the last quarter alone, it invested just over $2.4 billion on research and development, a $509 million increase from the same period a year ago. 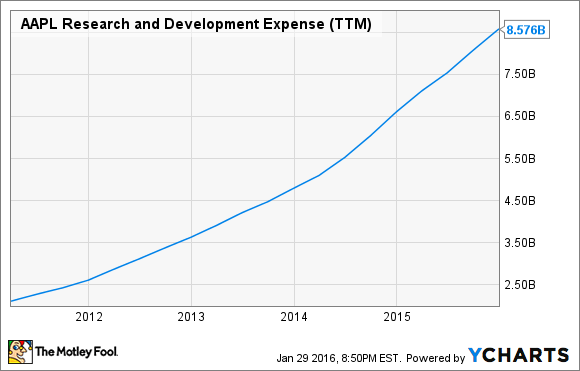 AAPL Research and Development Expense (TTM) data by YCharts. At the current spending run rate, Apple is now spending about $9.6 billion per year in research and development, putting it in the upper echelon of R&D spenders in the world of technology. Although, as an outsider I don't have direct knowledge of everything that Apple is investing in, I think I have a pretty good idea about some of the things that it has been seriously investing in, driving this continued surge in research and development spending. I think one area where Apple is investing very significantly is in chips. Its investments in the A-series processors that power its iPhone, iPad, and Apple TV devices only continue to grow, particularly as Apple seems to aim to deliver chips that are substantially ahead of those from the competition. However, it's not just the company's A-series processors that get these chip-related R&D dollars. Apple is surely working on future iterations of its Touch ID technology, and there have been numerous reports that the company is working to develop its own integrated touch and display driver chips (it currently sources discrete touch controllers and display driver chips externally). Finally, I'm quite sure that Apple is working on proprietary chip technologies to enable other, novel hardware features (and the requisite accompanying software) for its existing and future product lines. Consumers ultimately want to buy "experiences" these days and advancements in software are key to enabling those experiences. Apple needs to invest in enhancing iOS, adding in new APIs to allow for developers to take full advantage of new hardware features (such as 3D Touch, Touch ID, etc.) that the company brings to bear. The same argument applies to Mac OS, although I suspect that Mac OS doesn't get as much attention as iOS by virtue of the fact that iOS-based devices bring in significantly more revenue than Mac OS systems do. In addition to the core iOS/Mac OS products, Apple also needs to invest heavily in Watch OS. The hardware inside the Apple Watch will probably go through a similar period of hypergrowth in performance, which means that the software will be able to do a lot more. Taking full advantage of that hardware is going to be neither easy nor cheap. Then, finally from the operating system side of things, Apple seems to be taking the Apple TV far more seriously than it has in previous years. The Apple TV now runs a new, and much more robust operating system than previous models did, known as tvOS, and Apple will need lots of sharp engineers to evolve this over time. Beyond the operating systems, Apple also seems to be aggressively building out its software and services. Things like Apple Music, Apple Pay, iTunes, and likely a whole lot of other things that we don't even know about yet will require substantial investment to evolve over time, and I'm sure Apple is making those investments. As Apple's revenue has grown substantially, its ability to invest in totally new technologies has been significantly bolstered. There have been reports in the press about Apple having staffed up a fairly large team to try to build an electric, self-driving vehicle (the "Apple Car"), and recently there has been word that Apple is very seriously exploring virtual reality applications. Although the business or revenue opportunities for Apple in these areas aren't clear yet, I have little doubt that a sizable portion of its increased research and development spending is going into projects like these.